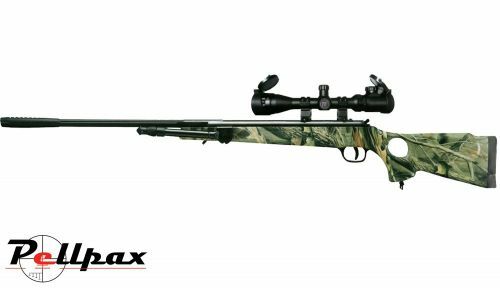 The Milbro Hunt Master is part of the new range of Milbro air rifles which offer excellent performance coupled with great handling characteristics to make them a purchase. The action of the rifle is powered by a spring and piston which offer great power, accuracy and consistency at all times and delivers enough power to hit targets at ranges up to 50 meters. The power from this spring and piston drives pellets down the precision rifled steel barrel towards the target. The barrel is encased in a full length shroud with an integral sound moderator on the end to reduce the muzzle crack as the pellet leaves the barrel. The stock is made from tough and hard wearing synthetic polymer, which is finished in a leafy camo pattern to blend in to almost all surroundings when out in the field. A bipod is attached directly to the stock towards the front which allows a solid and stable platform to be deployed wherever the shooting location might be.